Neoclassicism (from Greek νέος nèos and κλασσικός klassikòs classicus) is the name given to Western movements in the decorative and visual arts, literature, theatre, music, and architecture that draw inspiration from the "classical" art and culture of Ancient Greece or Ancient Rome. Neoclassicism was born in Rome in the mid-18th century, but its popularity spread all over Europe, as a generation of European art students finished their Grand Tour and returned from Italy to their home countries with newly rediscovered Greco-Roman ideals. 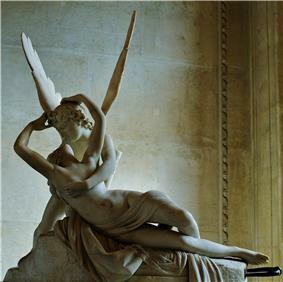 The main Neoclassical movement coincided with the 18th century Age of Enlightenment, and continued into the early 19th century, latterly competing with Romanticism. In architecture, the style continued throughout the 19th, 20th and up to the 21st century. The writings of Johann Joachim Winckelmann were important in shaping this movement in both architecture and the visual arts. 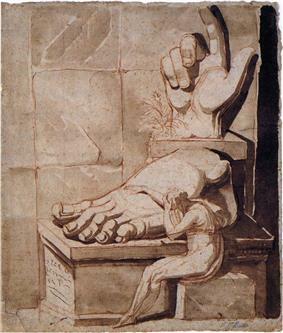 His books, Thoughts on the Imitation of Greek Works in Painting and Sculpture (1750) and Geschichte der Kunst des Alterthums ("History of Ancient Art", 1764) were the first to distinguish sharply between Ancient Greek and Roman art, and define periods within Greek art, tracing a trajectory from growth to maturity and then imitation or decadence that continues to have influence to the present day. Winckelmann believed that art should aim at "noble simplicity and calm grandeur", and praised the idealism of Greek art, in which he said we find: "not only nature at its most beautiful but also something beyond nature, namely certain ideal forms of its beauty, which, as an ancient interpreter of Plato teaches us, come from images created by the mind alone." The theory was very far from new in Western art, but his emphasis on close copying of Greek models was: "The only way for us to become great or if this be possible, inimitable, is to imitate the ancients". 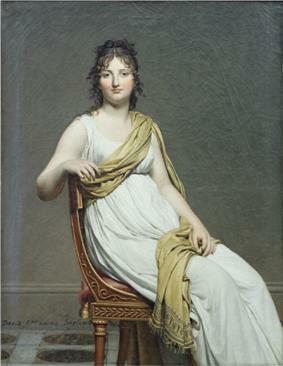 In English, the term "Neoclassicism" is used primarily of the visual arts; the similar movement in English literature, which began considerably earlier, is called Augustan literature, which had been dominant for several decades, and was beginning to decline, by the time Neoclassicism in the visual arts became fashionable. Though terms differ, the situation in French literature was similar. In music, the period saw the rise of classical music, and "neoclassicism" is used of 20th century developments. However the operas of Christoph Willibald Gluck, represented a specifically neo-classical approach, spelt out in his preface to the published score of Alceste (1769), which aimed to reform opera by removing ornamentation, increasing the role of the chorus in line with Greek tragedy, and using simpler unadorned melodic lines. 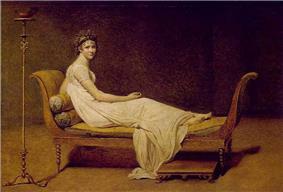 European Neoclassicism in the visual arts began c. 1760 in opposition to the then-dominant Baroque and Rococo styles. 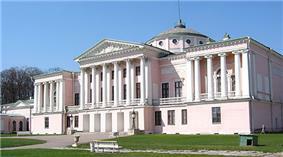 Rococo architecture emphasizes grace, ornamentation and asymmetry; Neoclassical architecture is based on the principles of simplicity and symmetry, which were seen as virtues of the arts of Rome and Ancient Greece, and were more immediately drawn from 16th century Renaissance Classicism. Each "neo"- classicism selects some models among the range of possible classics that are available to it, and ignores others. 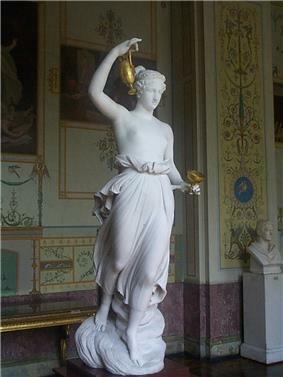 The neoclassical writers and talkers, patrons and collectors, artists and sculptors of 1765–1830 paid homage to an idea of the generation of Pheidias, but the sculpture examples they actually embraced were more likely to be Roman copies of Hellenistic sculptures. 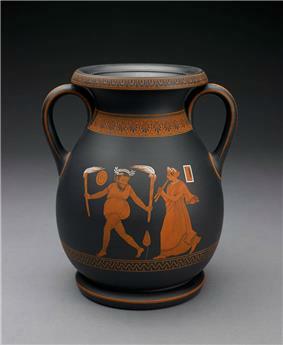 They ignored both Archaic Greek art and the works of Late Antiquity. 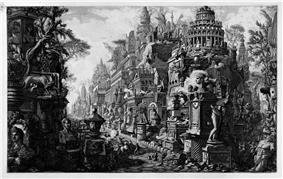 The "Rococo" art of ancient Palmyra came as a revelation, through engravings in Wood's The Ruins of Palmyra. Even Greece was all-but-unvisited, a rough backwater of the Ottoman Empire, dangerous to explore, so neoclassicists' appreciation of Greek architecture was mediated through drawings and engravings, which subtly smoothed and regularized, "corrected' and "restored" the monuments of Greece, not always consciously. As for painting, Greek painting was utterly lost: neoclassicist painters imaginatively revived it, partly through bas-relief friezes, mosaics, and pottery painting and partly through the examples of painting and decoration of the High Renaissance of Raphael's generation, frescos in Nero's Domus Aurea, Pompeii and Herculaneum and through renewed admiration of Nicholas Poussin. 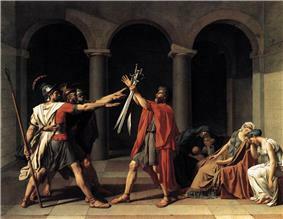 Much "neoclassical" painting is more classicizing in subject matter than in anything else. A fierce, but often very badly informed, dispute raged for decades over the relative merits of Greek and Roman art, with Winckelmann and his fellow Hellenists generally the winning side. 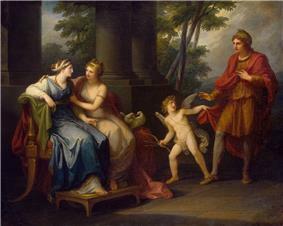 It is hard to recapture the radical and exciting nature of early neo-classical painting for contemporary audiences; it now strikes even those writers favourably inclined to it as "insipid" and "almost entirely uninteresting to us"—some of Kenneth Clark's comments on Anton Raphael Mengs' ambitious Parnassus at the Villa Albani, by the artist who his friend Winckelmann described as "the greatest artist of his own, and perhaps of later times". 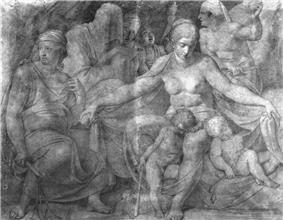 The drawings, subsequently turned into prints, of John Flaxman used very simple line drawing (thought to be the purest classical medium) and figures mostly in profile to depict The Odyssey and other subjects, and once "fired the artistic youth of Europe" but are now "neglected", while the history paintings of Angelica Kauffman, mainly a portraitist, are described as having "an unctuous softness and tediousness" by Fritz Novotny. 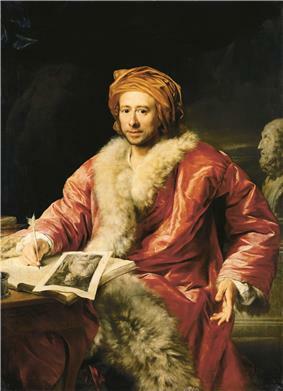 Rococo frivolity and Baroque movement had been stripped away but many artists struggled to put anything in their place, and in the absence of ancient examples for history painting, other than the Greek vases used by Flaxman, Raphael tended to be used as a substitute model, as Winckelmann recommended. 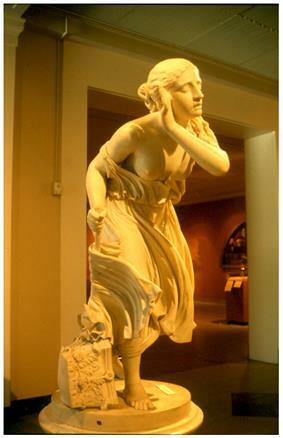 If Neoclassical painting suffered from a lack of ancient models, Neoclassical sculpture tended to suffer from an excess of them, although examples of actual Greek sculpture of the "classical period" beginning in about 500 BC were then very few; the most highly regarded works were mostly Roman copies. 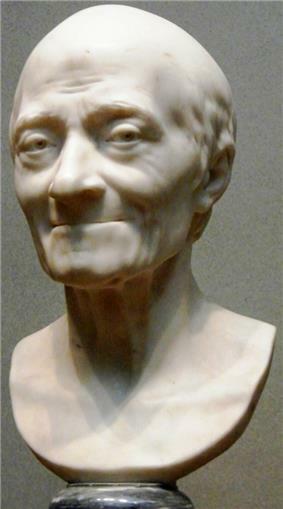 The leading Neoclassical sculptors enjoyed huge reputations in their own day, but are now less regarded, with the exception of Thomas Jefferson, Ben Franklin and other luminaries of the new republic. 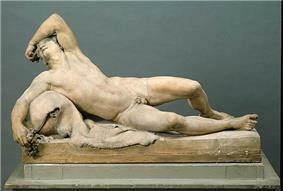 An early neoclassicist in sculpture was the Swede Johan Tobias Sergel,. 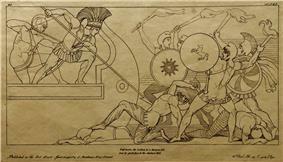 John Flaxman was also, or mainly, a sculptor, mostly producing severely classical reliefs that are comparable in style to his prints; he also designed and modelled neoclassical ceramics for Josiah Wedgwood for several years. 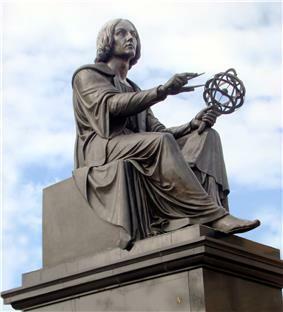 Johann Gottfried Schadow and his son Rudolph, one of the few neoclassical sculptors to die young, were the leading German artists, with Franz Anton von Zauner in Austria. 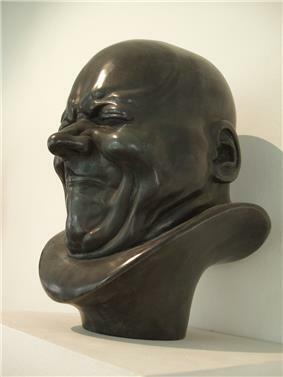 The late Baroque Austrian sculptor Franz Xaver Messerschmidt turned to Neoclassicism in mid-career, shortly before he appears to have suffered some kind of mental crisis, after which he retired to the country and devoted himself to the highly distinctive "character heads" of bald figures pulling extreme facial expressions. Like Piranesi's Carceri, these enjoyed a great revival of interest during the age of psychoanalysis in the early 20th century. 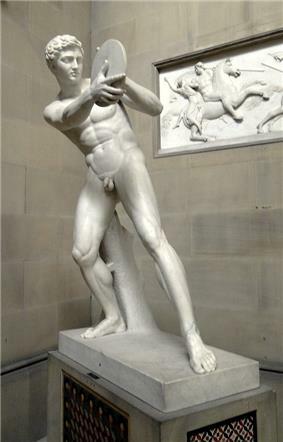 The Dutch neoclassical sculptor Mathieu Kessels studied with Thorvaldsen and worked almost exclusively in Rome. 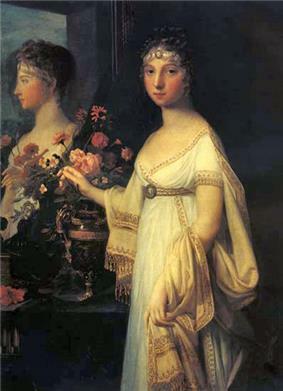 Neoclassicism first gained influence in England and France, through a generation of French art students trained in Rome and influenced by the writings of Winckelmann, and it was quickly adopted by progressive circles in other countries such as Sweden and Russia. 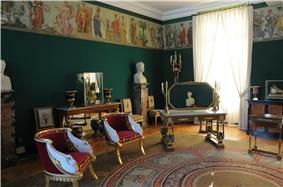 At first, classicizing decor was grafted onto familiar European forms, as in the interiors for Catherine II's lover Count Orlov, designed by an Italian architect with a team of Italian stuccadori: only the isolated oval medallions like cameos and the bas-relief overdoors hint of neoclassicism; the furnishings are fully Italian Rococo. From about 1800 a fresh influx of Greek architectural examples, seen through the medium of etchings and engravings, gave a new impetus to neoclassicism, the Greek Revival. 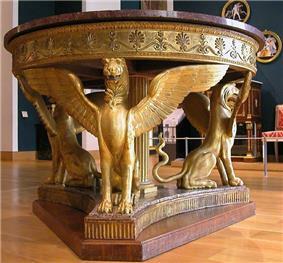 At the same time the Empire style was a more grandiose wave of neoclassicism in architecture and the decorative arts. 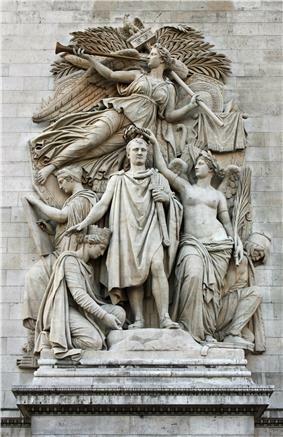 Mainly based on Imperial Roman styles, it originated in, and took its name from, the rule of Napoleon I in the First French Empire, where it was intended to idealize Napoleon's leadership and the French state. The style corresponds to the more bourgeois Biedermeier style in the German-speaking lands, Federal style in the United States, the Regency style in Britain, and the Napoleonstil in Sweden. According to the art historian Hugh Honour "so far from being, as is sometimes supposed, the culmination of the Neo-classical movement, the Empire marks its rapid decline and transformation back once more into a mere antique revival, drained of all the high-minded ideas and force of conviction that had inspired its masterpieces". 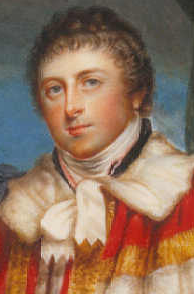 An earlier phase of the style was called the Adam style in Great Britain and "Louis Seize", or Louis XVI, in France. 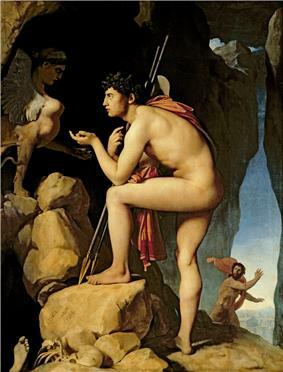 Neoclassicism continued to be a major force in academic art through the 19th century and beyond—a constant antithesis to Romanticism or Gothic revivals— although from the late 19th century on it had often been considered anti-modern, or even reactionary, in influential critical circles. The centres of several European cities, notably St Petersburg and Munich, came to look much like museums of Neoclassical architecture. Gothic revival architecture (often linked with the Romantic cultural movement), a style originating in the 18th century which grew in popularity throughout the 19th century, contrasted Neoclassicism. Whilst Neoclassicism was characterized by Greek and Roman-influenced styles, geometric lines and order, Gothic revival architecture placed an emphasis on medieval-looking buildings, often made to have a rustic, "romantic", appearance. Very light and loose dresses, usually white and often with shockingly bare arms, rose sheer from the ankle to just below the bodice, where there was a strongly emphasized thin hem or tie round the body, often in a different colour. The shape is now often known as the Empire silhouette although it predates the First French Empire of Napoleon, but his first Empress Joséphine de Beauharnais was influential in spreading it around Europe. A long rectangular shawl or wrap, very often plain red but with a decorated border in portraits, helped in colder weather, and was apparently laid around the midriff when seated – for which sprawling semi-recumbent postures were favoured. 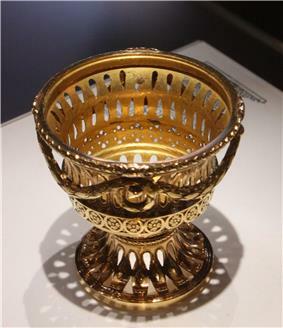 By the start of the 19th century, such styles had spread widely across Europe. Classically inspired male hair styles included the François-Joseph Talma, who upstaged his wigged co-actors when appearing in productions of works such as Voltaire's Brutus. In 1799 a Parisian fashion magazine reported that even bald men were adopting Titus wigs, and the style was also worn by women, the Journal de Paris reporting in 1802 that "more than half of elegant women were wearing their hair or wig à la Titus. 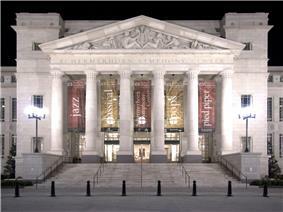 In American architecture, neoclassicism was one expression of the American Renaissance movement, ca 1890–1917; its last manifestation was in Beaux-Arts architecture, and its very last, large public projects were the Lincoln Memorial (highly criticized at the time), the National Gallery of Art in Washington, D.C. (also heavily criticized by the architectural community as being backward thinking and old fashioned in its design), and the American Museum of Natural History's Roosevelt Memorial. These were considered stylistic anachronisms when they were finished. In the British Raj, Sir Edwin Lutyens' monumental city planning for New Delhi marks the glorious sunset of neoclassicism. World War II was to shatter most longing for – and imitation of – mythical, heroic times. Conservative modernist architects such as Auguste Perret in France kept the rhythms and spacing of columnar architecture even in factory buildings. Where a colonnade would have been decried as "reactionary", a building's pilaster-like fluted panels under a repeating frieze looked "progressive." Pablo Picasso experimented with classicizing motifs in the years immediately following World War I, and the Art Deco style that came to the fore following the 1925 Paris Exposition des Arts Décoratifs, often drew on neoclassical motifs without expressing them overtly: severe, blocky commodes by É. J. Ruhlmann or Sue et Mare; crisp, extremely low-relief friezes of damsels and gazelles in every medium; fashionable dresses that were draped or cut on the bias to recreate Grecian lines; the art dance of Isadora Duncan; the Streamline Moderne styling of US post offices and county court buildings built as late as 1950; and the Roosevelt dime. There was an entire 20th century movement in the Arts which was also called Neo-classicism. It encompassed at least music, philosophy, and literature. It was between the end of World War I and the end of World War II. For information on the musical aspects, see 20th century classical music and Neoclassicism (music). For information on the philosophical aspects, see Great Books. This literary neo-classical movement rejected the extreme romanticism of (for example) dada, in favour of restraint, religion (specifically Christianity) and a reactionary political program. Although the foundations for this movement in English literature were laid by T. E. Hulme, the most famous neoclassicists were T. S. Eliot and Wyndham Lewis. In Russia, the movement crystallized as early as 1910 under the name of Acmeism, with Anna Akhmatova and Osip Mandelshtam as the leading representatives. Neoclassicism in music is a 20th-century movement; in this case it is the classical music of the late 18th and early 19th century that is being revived, not the music of the ancient world. It was ultimately a response to German Modernism in the first part of the 20th century. It was an anti-progress, anti-industrial and anti-innovative musical style. This was inspired by composers claiming that mankind is inherently "diatonic" and "tonal" ; the opposite of ultra-modernist musical influences and compositions at the time. Composers started to look back to historical musical influences. Although the practice of borrowing musical styles from the past has not been uncommon throughout musical history, art musics have gone through periods where musicians used modern techniques coupled with older forms or harmonies to create new kinds of works. Notable compositional characteristics are, the return to tonality, return to conventional forms (dance suites, concerti grossi, evident sonata forms, etc. ), return to the idea of absolute music, the use of light musical textures, and the composers conciseness of musical expression. In classical music, this was most notably perceived between the 1920s and the 1950s. Igor Stravinsky is the best-known composer using this style; he effectively began the musical revolution with his Bach-like Octet for Wind Instruments (1923). A particular individual work that represents this style well is Prokofiev's Classical Symphony No. 1 in D, which is reminiscent of the symphonic style of Haydn or Mozart. Neoclassical ballet comes from the same period, and aimed to de-clutter the Russian Imperial style in terms of steps and narrative, while retaining its technical innovations. In 1905–1914 Russian architecture passed through a brief but influential period of neoclassical revival; the trend began with recreation of Empire style of alexandrine period and quickly expanded into a variety of neo-Renaissance, palladian and modernized, yet recognizably classical schools. They were led by architects born in the 1870s, who reached creative peak before World War I like Ivan Fomin, Vladimir Shchuko, Ivan Zholtovsky. When economy recovered in the 1920s, these architects and their followers continued working in primarily modernist environment; some (Zholtovsky) strictly followed the classical canon, others (Fomin, Schuko, Ilya Golosov) developed their own modernized styles. After a lull during the period of modern architectural dominance (roughly post-World War II until the mid-1980s), neoclassicism has seen somewhat of a resurgence. 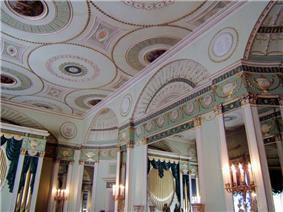 In Britain a number of architects are active in the neoclassical style. Examples of their work include two university libraries: Quinlan Terry's Maitland Robinson Library at Downing College and Robert Adam Architects' Sackler Library.